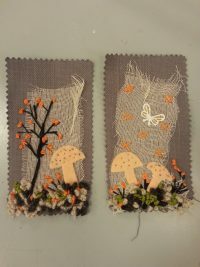 Our friendly weekly textile arts class is about experimenting and designing with textiles. Working with different threads, fabrics, dyes, materials and techniques, Debbie will support you to build up an understanding of how you can interpret textures, surfaces and ideas into works of art creatively and confidently. Try your hand at stitching, printing, felting, weaving and more! Our group is small for a personal approach. Choose to work on a new project or technique under Debbie’s expert guidance or bring a project of your own to work on. Projects suit all abilities stretching the more advanced student and nuturing the beginner. All are welcome!